We are pleased to inform you that Hidden Gem stock of May'14 - Rane Brake Lining Ltd (BSE Code: 532987, NSE Code: RBL) has given absolute returns of 506% and is a 6-Bagger stock for our Hidden Gems members in 3.5 years. Our team suggested Buy on Rane Brake Lining Ltd at price of Rs. 200 on 31st May 2014 with a target price of Rs. 410. Stock achieved its target price and we informed our members to continue to hold it for long term. Stock price of Rane Brake Lining has made its all time high of Rs. 1450 in June this year and closed at Rs. 1212.55 this week giving as on date returns of 506% in period of 3.5 years. In June 2017 quarter, net profit of Rane Brake Lining declined 30.62% to Rs 7.32 crore against Rs 10.55 crore during the previous quarter ended June 2016. Sales declined 13.78% to Rs 100.31 crore in the quarter ended June 2017 as against Rs 116.34 crore during the previous quarter ended June 2016. 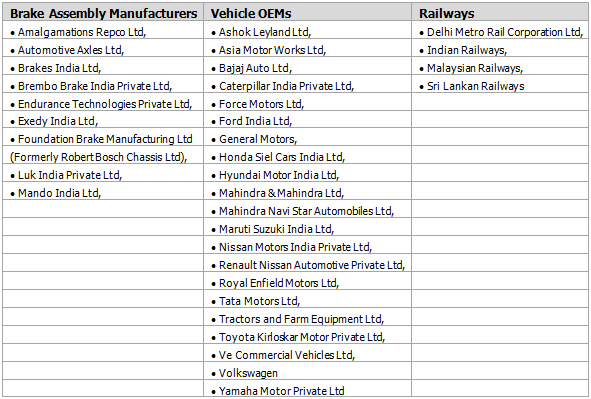 The company’s overall India OEM sales and Aftermarket sales registered a healthy growth over last couple of years. RBL enjoyed good growth in the OE segment on the back of mass supplies to successful models in passenger car and utility vehicle segments. The robust growth in the Aftermarket segment is attributed to increase sales of Asbestos-free linings and favourable pull in northern and southern region.